FOXBOROUGH, MA—Explaining that he draws inspiration from the Atlanta Falcons signal caller, New England Patriots quarterback Tom Brady told reporters Tuesday that he continues to play the game with Matt Ryan’s chip on his shoulder. 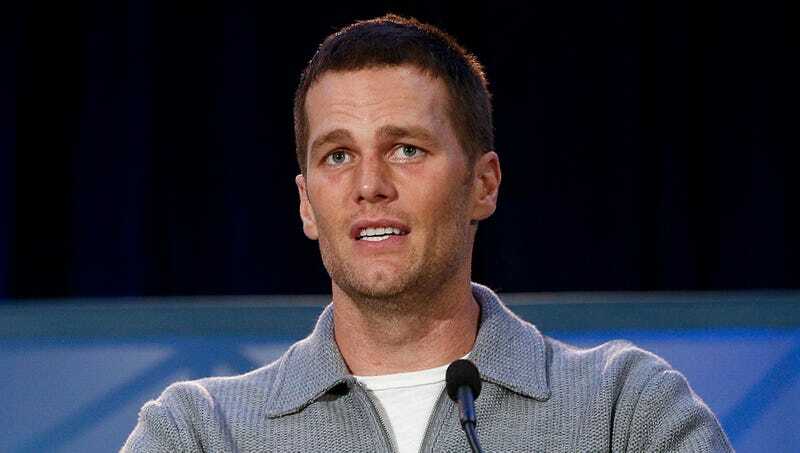 “When I hear people say Matt isn’t a proven winner and that he collapses in big moments, it just makes me want to work that much harder,” Brady told reporters, adding that the doubters who say Ryan is just another modern quarterback with gaudy numbers and no championships are what motivate him to show up to the practice field first and leave last. “I hear all the sports-talk pundits and newspaper headlines criticizing Matt every time I work out, and those are the things that keep me going when I’m feeling tired or want to quit. In a way, I’m almost thankful for all the people who say Matt can’t be the best.” Brady went on to add that whenever he needs a little extra motivational boost, he recalls how Ryan probably felt after blowing a 25-point lead in Super Bowl LI to the Patriots.